The schedule for the 2009 annual meeting to be held in San Francisco has been posted below and is available for PDF download. Full abstracts are here. HOTEL: As usual, ADS will meet as one of the “sister societies” at the Annual Meeting of the Linguistic Society of America. This year it will be at the Hilton San Francisco, 333 O’Farrell St., San Francisco 94102; phone 415-771-1400. ADS members are eligible for special LSA rates: Single or double room $99 per night, triple or quad $129, executive floor $149, the latter with access to the Executive Level Lounge featuring 180 degree views from the 45th floor, continental breakfast, and hors d’oeuvres in the evening. You may make room reservations by calling 1-800-HILTONS (1-800-445-8667) and requesting the LSA rate; online reservations should be made directly at the Hilton San Francisco’s LSA Reservations website, accessible by a link from the LSA website, www.lsadc.org. These rates will also be honored, by advance reservation only and subject to availability, from January 4-7 and January 11-14. To qualify for LSA’s special rates, reservations must be made by Dec. 16. For further details, see the LSA website. REGISTRATION: As guests of the Linguistic Society, we must register with them. Thankfully, ADS members may register at the LSA members’ rate, even if they are not LSA members: $110 for regular members, $45 for students, $85 for emeriti. Deadline for preregistration at these rates is December 12. For details and to register, go to the LSA website. Words of the Year: As we have done every year since 1990, we will look back at the preceding year and choose Words of the Year. The nominating meeting is at 5:45 p.m. Thursday, and the final vote at 5:30 p.m. Friday (see schedule below). All members and friends are invited to participate. Name of the Year: At the start of our WOTY session on Friday, we will also host the American Name Society’s vote on Name of the Year 2008. ADS members and friends are welcome to participate in this vote too. BYOB Reception: After the Friday voting on Words of the Year, you’re invited to our annual Bring-Your-Own-Book reception from 6:30 to 7:30 p.m. Bring your new book or books; we’ll have tables along the walls where you can display them. President-elect and program chair for the years 2009–10, to succeed as president 2011–12: Luanne von Schneidemesser, Dictionary of American Regional English. Executive Council for the years 2009 through 2012: Julie Roberts, U. of Vermont. Nominating Committee member for the years 2009 and 2010: Richard W. Bailey, U. of Michigan. Future LSA-ADS meeting: 2010 January 7–9 Hilton Baltimore. Program Committee: Connie Eble, U. of North Carolina, Chapel Hill, chair; Charles Boberg, McGill U.; Allison Burkette, U. of Mississippi; Patricia Cukor-Avila, U. of North Texas; Matthew Gordon, U. of Missouri, Columbia; Thomas Nunnally, Auburn U.; Benjamin Torbert, U. of Missouri-St. Louis; Benjamin Zimmer, Thinkmap Inc. In serendipitous tribute to William Labov’s Social Stratification of English in New York City, all ADS meetings will be on the fourth floor. Executive Council Meeting, 1:00–3:00 p.m. Open meeting; all members welcome. Presiding: ADS President William A. Kretzschmar, Jr., U. of Georgia. Annual Business Meeting, 3:00–3:30 p.m. Most of the business of the Society is conducted at the preceding Executive Council meeting, to which all members are invited (see above). This meeting hears a report on that one and also votes on the Nominating Committee’s recommendation for ADS elections (see above). 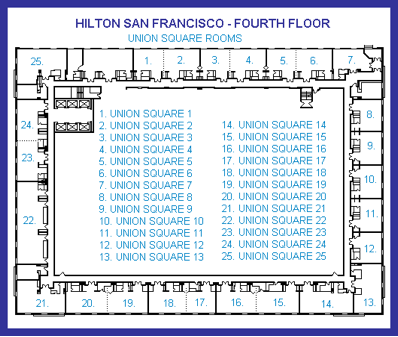 Session 1: 4:00–5:30 p.m. Hilton San Francisco, Union Square 3&4. Chair: Malcah Yaeger-Dror, U. of Arizona. Words of the Year Nominations, 5:45–6:45 p.m. Hilton San Francisco, Union Square 3&4. Open meeting of the New Words committee; ADS members and friends welcome. Chair, Grant Barrett, Double-Tongued Dictionary.This meeting reviews nominations for Words of the Year 2008. Final candidates will be identified in preparation for the vote at 5:30 p.m. Friday. Sister Society Meet and Greet Reception, 8:30–10:00 p.m. Hilton San Francisco, Yosemite C.
Members of ADS, and of other “Sister Societies,” are invited to this cash bar sponsored by the Society for the Study of the Indigenous Languages of the Americas. Session 3: 11 a.m.–12:30 p.m. Hilton San Francisco, Union Square 3&4. Session 4: 2:00–3:30 p.m. Hilton San Francisco, Union Square 3&4. Session 5: 3:45–5:15 p.m. Hilton San Francisco, Union Square 3&4. Words of the Year Vote, 5:30–6:30 p.m. Hilton San Francisco, Union Square 15&16. Words in half a dozen categories as well as a Word (or Phrase) of the Year will be chosen from the slate of nominees determined at Thursday evening’s meeting. Before each vote, brief statements will be invited from advocates for or against the candidates. The hour will begin with the American Name Society’s vote on its choice of Name of the Year. All ADS members, ANS members, and friends are welcome to participate. Bring-Your-Own-Book Exhibit and Reception, 6:30–7:30 p.m. Hilton San Francisco, Union Square 3&4. Session 7: 10:30 a.m.–12:00 noon. Hilton San Francisco, Union Square 3&4. Annual Luncheon, 12:15–1:45 p.m. Speaker: Bill Kretzschmar. ADS President: Postmodern Dialectology. Session 9: 4:00–5:00 p.m. Hilton San Francisco, Union Square 3&4. Panelists: Benjamin Torbert (moderator), U. of Missouri-St. Louis; Grant Barrett, Double-Tongued Dictionary; Christine Mallinson, U. of Maryland-Baltimore County; Rob Podesva, Georgetown U; Jeff Reaser, North Carolina State U.; Rebecca Roeder, Michigan State U., and Julie Sweetland, Center for Inspired Teaching. This session will consist of a round-table panel discussion conducted by early-career linguists who work both inside and outside Academe. Members of American Dialect Society, these panelists will represent a variety of different career paths. Anyone who is or will soon be on the job market is encouraged to attend, as are senior scholars who may want to share advice during the Q&A portion. We will cover the application process for academic jobs in detail, including selecting which jobs to apply for, writing the CV and job letter, interviewing in the semifinal round on the phone or at convention, interviewing on the campus visit, and negotiating a contract. We will also discuss job opportunities for linguists who wish to work outside Academe. You are currently reading 2009 Annual Meeting Schedule (UPDATED) at American Dialect Society.